So consequently, you’ll find performance comparison between Boot-up Times, Memory Usage, System Responsiveness and Shutdown Delay, mainly. I’ve also added data concerning hardware recognition & ACPI, and few other performance related data which you’ll get to read. I installed each operating system on the same hardware (obviously). 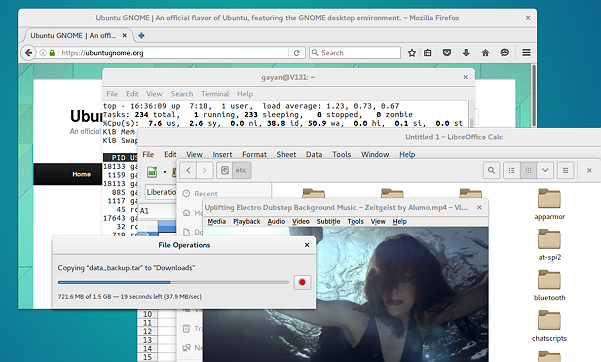 I have a single partition created for the sole purpose of testing new GNU/Linux distributions. And all three flavors were installed into it, one after the other. Before installing each operating system, I securely wiped out the partition so that I end up with ‘clean’ sectors. After installing, I let the newly installed OS to boot 5-6 times for letting things to settle down (because there are some applications and especially utilities such as ‘ureadahead‘ -- a tool that significantly speeds up boot-up times of Ubuntu, that require a couple of reboots to work properly). I tried not to ‘touch’ (manual tweaks etc) anything on the OS. Although I did add the system monitor (I used it to measure the memory usage) to the status-bar or to a launcher (if one is present). I did that because if I were to open it each time using the start-menu or otherwise, it would’ve increased the memory usage, thus negatively affecting the accuracy of the memory usage reading. For further enhancing the accuracy, of each test, I took five samples (except for the system responsiveness test. But on two occasions I had to run it twice). Then I evaluated the hardware recognition (I don’t think anyone needs an introduction to what this means) & stability. For evaluating the stability, I made sure to use the newly installed operating system as my main operating system quite extensively, for at least two days. In this instance, I ran Ubuntu 16.04 LTS for about 5 days, Kubuntu 16.04 LTS for about 2 days and Ubuntu GNOME 16.04 LTS for about 4 days. I looked for things like major bugs that could make the OS unstable (for instance, in Ubuntu 15.10 I came across a bug that forcefully logged me out of the desktop every now and then. And when that happened, I lost any unsaved data!) and application crashing etc. Both Ubuntu 16.04 LTS and Ubuntu GNOME 16.04 LTS use the same installer. It’s called ‘Ubiquity’. 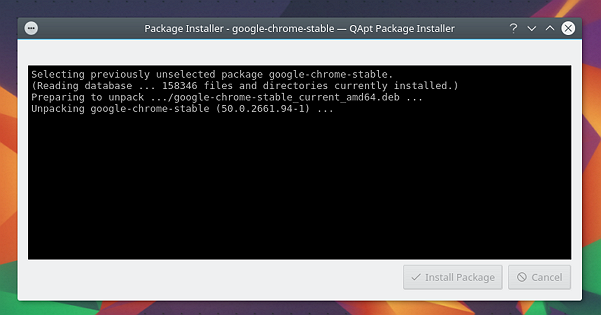 And as I’ve said many times, this is one of the most reliable and intuitive installers out there. In all these years of testing, I don’t recall even a single major issue that I came across when using it. Kubuntu 16.04 LTS on the other hand uses a different installer called ‘Calamares’. It’s being used by many KDE based distributions (Kubuntu, KaOS, Manjaro, Netrunner etc). Just like ‘Ubiquity’ it too is a fantastically intuitive program, but unfortunately, couple of times, I came across a major issue with this installer that made it almost impossible to install the operating system that used it, if it wasn’t for my experience (didn’t put it in an egoistic sense 😛 ). What happens is that the installer totally crash at ‘Keyboard Setup’ and aborts the installation. I first came across it as far as in 2014 while I was reviewing Netrunner 14 Frontier. I’ve ran across this issue in a previous Kubuntu release too (15.04, I think). But interestingly, I’ve used few other KDE based GNU/Linux distributions that used Calamares, in between, and Calamares ran just fine on those occasions. But with Kubuntu 16.04 LTS this happened once again, as you can see from the below screenshot. If you come across this issue, then this is the way to fix it. Make sure the computer is not connect to the Internet (turn off Wi-Fi, 3G etc). Then reboot the computer and run the installer again. When you come to setting up the Time Zone, leave the default Time Zone untouched. Then when you get to setting up the keyboard, also make sure to not change anything. This should fix the issue (it has worked for me in the past occasions and it worked this time too). Sure this time the installer won’t be able to detect your Time Zone, language and keyboard type automatically, but you can fix it by simply changing them from the ‘System Settings’ after installing the OS anyway. Do I consider this to be a major issue? Obviously! After all, this is a LTS release in which stability and security outsmart other ‘exciting’ elements (up-to-date software, major new features etc). I was lucky to find a way to bypass it, but a new ‘Linux’ user wouldn’t have even stood a chance. I also noticed, although this isn’t a major issue for me at all, that some of the widgets of the Plasma desktop (CPU Load Monitor, Network Monitor etc) didn’t quite work as expected. They failed to correctly render the widget layout, as you can see from the below image. Update: Actually, the problem was that I wasn’t using the correct method for re-sizing the widget because apparently, after bringing the mouse pointer over a widget, now you have to press and hold both the Ctrl key and the left mouse button to get the widget’s control-bar. Not the most intuitive way I must say. It worked nonetheless, and a big thanks goes to Michal (comments) for pointing that out. Both Ubuntu 16.04 LTS and Ubuntu GNOME 16.04 LTS use the same software center. And as I mentioned in my Ubuntu 16.04 LTS review, this software center can’t install ‘.deb’ files, and it’s the same under Ubuntu GNOME 16.04 LTS as well. The below screenshot is from Ubuntu 16.04 LTS (of course), I just forgot to take a screenshot in Ubuntu GNOME, and after writing this review, I immediately wiped out the data on that partition (I added this info to this review after few hours of publishing the article originally). Sorry about that guys. Kubuntu 16.04 LTS uses a software center of its own and I was easily able to install a third-party ‘.deb’ package (Google Chrome to be precise) without any issues whatsoever. Excellent. As you can see, Ubuntu 16.04 LTS is the fastest to boot, beating both Kubuntu and Ubuntu GNOME by 35% & 29.5%, respectively. Personally, except for Ubuntu GNOME, I’m not surprised by these readings. Kubuntu (or most KDE based distributions in general) has never been that fast while booting. 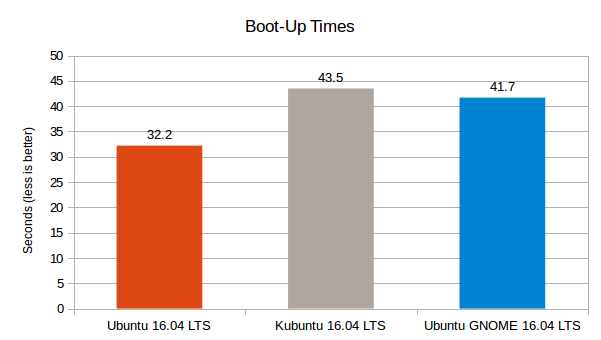 To its credit however, Kubuntu 16.04 LTS boots 21% faster compared to its predecessor, Kubuntu 15.10. 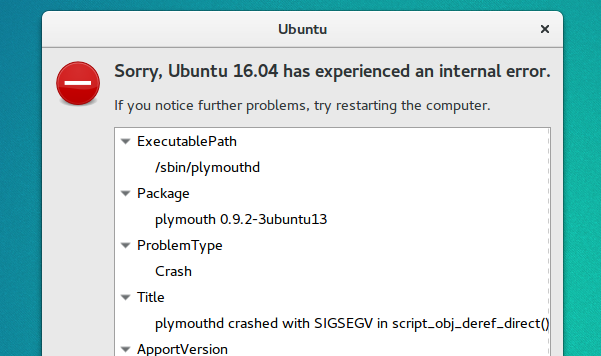 I came across an issue that tremendously slowed down Ubuntu GNOME 16.04 LTS and I have good reasons to believe it’s plymouth’s (the tool that displays the boot-logo) fault. What happened was that, precisely 6 out of 10 times (yes I counted them) when booting, plymouth failed to show the graphical boot logo of Ubuntu GNOME and only showed a black screen. When this happens the boot-up process gets stuck for about 15-17 seconds! After this long & agonizing delay the system starts to boots up again from where it left off, though. And justifying my suspicion, when this happens, within a very short period after I log into the desktop, I get an error saying ‘plymouth’ has crashed. But 4 out of those 10 times where the plymouth doesn’t fail to show the boot-logo, Ubuntu GNOME 16.04 LTS boots quite fast. According to my numbers, the boot-up times were anywhere around 32 seconds to 34 seconds which is very close to Ubuntu 16.04 LTS’s boot-up times. And it makes sense too because unlike Kubuntu, both Ubuntu and Ubuntu GNOME have so much in common. Not only they’re all based on the Ubuntu Core, but Ubuntu and Ubuntu GNOME share the same desktop applications, and Unity even uses lot of GNOME technologies for rendering its desktop shell as well. Anyhow, coming back to the issue, yes I tried updating the system, but the issue is still there. Is this a big issue? No, not necessarily. But keep in mind that this is a LTS release, therefore, these types of issues can be frustrating from that point of view. Update: After 2 days of using Ubuntu GNOME 16.04 LTS, I just received an update and it seems to have fixed the whole situation actually. I’ve boot into the OS many times after updating and have been using Ubuntu GNOME for 2 more days, so far haven’t seen it, not even once. And the system now boots within 32-34 seconds as well. 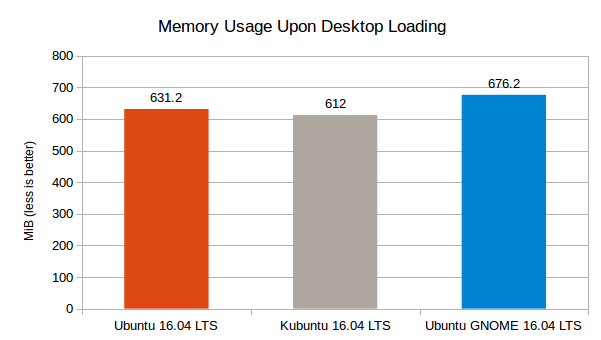 Kubuntu 16.04 LTS used the least amount of memory compared to both Ubuntu 16.04 LTS (3.1%) and Ubuntu GNOME 16.04 LTS (10.5%). 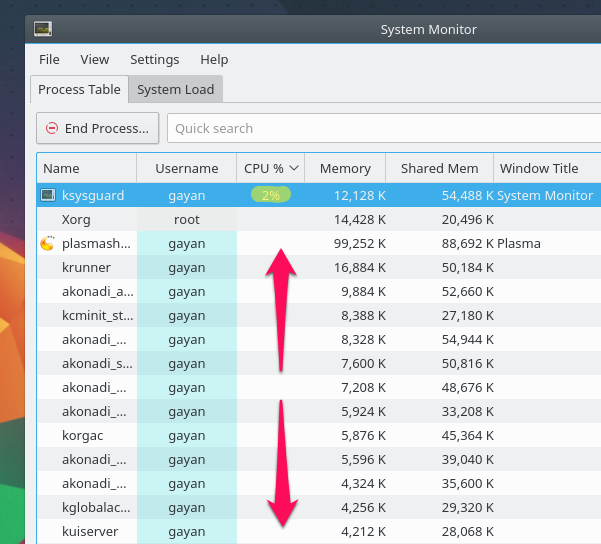 Kubuntu was also impressive when compared to its predecessor where the memory usage had increased only by a small amount (3%), where both Ubuntu (48.1%) and Ubuntu GNOME’s (66%) memory usage has increased by a lot, compared to their predecessors. Note: I usually add the power usage (idle) next. But as I mentioned during my Ubuntu 16.04 LTS review, the battery of my laptop is dead, therefore I don’t have any data concerning the power usage. Sorry about that. A good operating system at idle should keep the CPU usage around zero, although, there’s nothing the OS can do if a buggy program eats up the CPU. 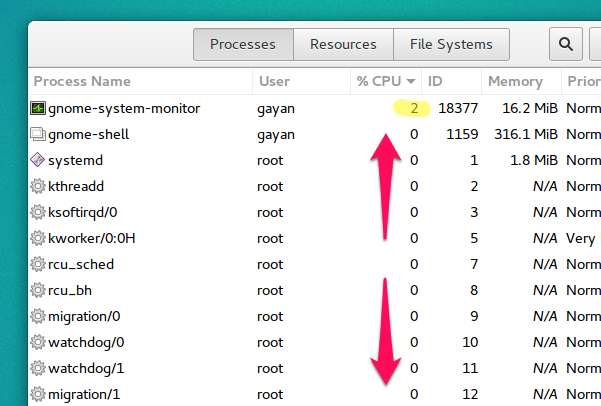 Low CPU usage at idle also means less power consumption as well. 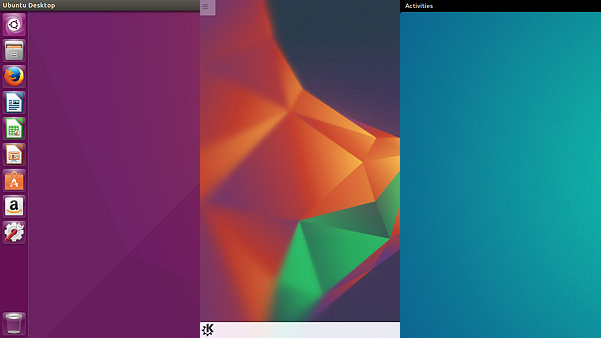 I’m happy to say that all three Ubuntu flavors did extremely well here. As you can see, at idle the CPU usage was very close to zero and remained so for lengthy time-frames, although here & there some app would pop-out which is pretty normal. I do admit that the hardware on my Dell laptop is more ‘Linux friendly’. Ubuntu specifically has been able to run on them quite well in my experience. And it’s no exception this time around either, because all Ubuntu flavors were able to correctly recognize and configure my hardware (except for the fingerprint reader. It has never fully worked on GNU/Linux. The manufacture doesn’t even care to release a driver!). But keep in mind what I said. My hardware is more ‘Linux friendly. Therefore, if you have different hardware (such as proprietary Nvidia & AMD/ATI GPUs, sound cards etc for instance) you may not experience the same level of stability I experienced. Other features such as Suspending and waking up also worked like a charm on all three flavors. 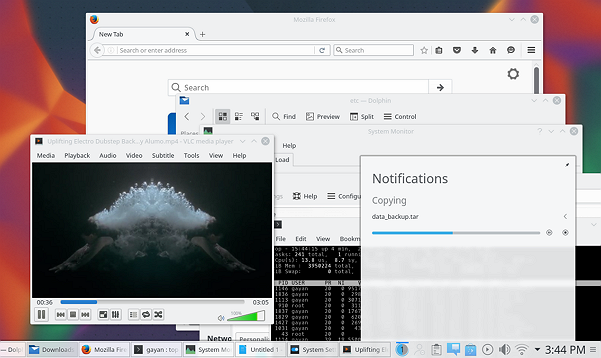 Also, as far as the application crashing is concerned, they were all very impressive, even in Kubuntu because KDE has never been extremely stable in my experience. For the 2 days I used it, not even a single app crashed. Kudos to KDE developers. 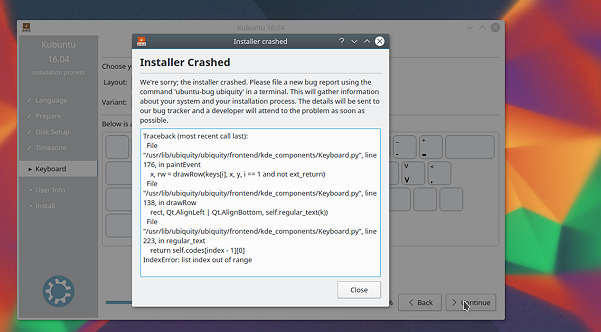 The only app crash I saw was the ‘plymouth’ incident that I mentioned earlier which happened in Ubuntu GNOME, but that too was fixed with a recent update. The hard disk drive is the primary storage device of a computer. But unfortunately, it’s also one of the most slowest (whether it’s a rotational disk or a solid state drive) component of a computer. If all the reads and writes that occur in it is not properly handled, your operating system can get very slow and unresponsive. And I’ve been using a very simple test to find out how responsive an operating system is when the hard disk is put under stress. What I do is simple. First I copy a file (which is usually about 1.5 GB) within two locations in the Home folder of the currently logged in user. And as soon as the OS starts to copy it, I immediately try to open a multimedia file. Then as soon as I’m done double clicking on the multimedia file, then I use the start-menu (or Dash if it’s Ubuntu) to search and open a few programs. And while the OS is busy handling all that, I try to navigate to a folder that contains somewhat large number of files through the file manager. As mentioned in the review, it didn’t go well at first. In fact it sucked! Other than an app or two (all of which were lightweight ones), until the file copy was fully finished copying, the rest did not get opened nor did the multimedia was played either. But since this has happened to me in the past under Ubuntu, I made a simple tweak to the system, and it completely fixed the situation. Almost all the programs were opened, VLC (I installed it manually using ‘apt-get’ in all three flavors) was able to open the multimedia file quickly and its playback was never interrupted. Mouse pointer also didn’t lose its sensitivity that whole time, although the file manager kind of got stuck for 2-3 seconds, but rest of the system functioned normally. At the end of the day, I loved Ubuntu 16.04 LTS’s responsiveness after the fix. Note: All these three screenshots are mere illustrations and were not taken at the time of actual testing. 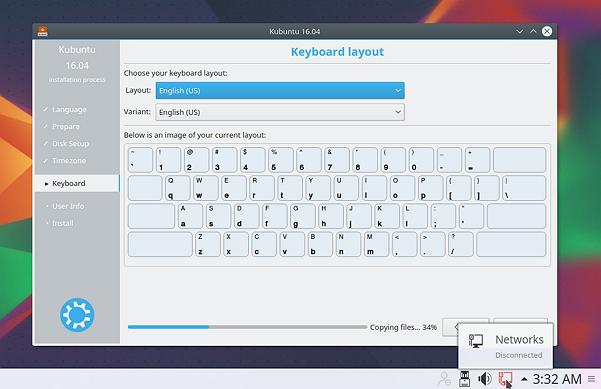 The KDE Plasma desktop of Kubuntu did extremely well too, if not better! Just like its predecessor (which also did very well), Kubuntu 16.04 LTS didn’t require any manual tweaks either. It rocked out of the box 🙂 . The GNOME flavor had virtually the same issue as of Ubuntu 16.04 LTS so I won’t go into the details. It’s a carbon copy of what happened in Ubuntu 16.04 LTS. So then I applied the tweak I applied to Ubuntu 16.04 LTS, and unsurprisingly, it completely fixed the situation as well. So all in all, I was very happy with the responsiveness of the three flavors, although to its credit, as mentioned, Kubuntu performed extremely well by default, and it didn’t require any tweaks. 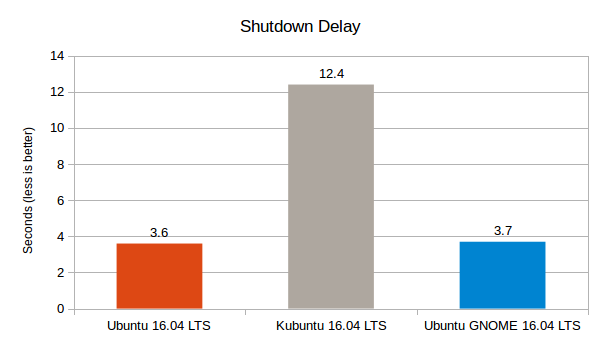 Ubuntu 16.04 LTS and Ubuntu GNOME 16.04 LTS have (almost) the same shutdown delay. They both outperformed Kubuntu 16.04 LTS by being about 244% faster. The main focus of an Ubuntu LTS is stability and performance. And in that regard, Ubuntu 16.04 LTS did really well. And performance-wise, the memory increase is the major negative element. Other than that, it’s very stable and as mentioned in my original review, many of the subtle issues have also been addressed as well. Kubuntu 16.04 LTS has a buggy installer. And I consider that to be a huge concern for some end-users. It crashed in my case when it tried to switch the language & keyboard from the default selection. But that doesn’t mean it’ll fail and crash on every language other than US English. Still, it’s a nasty and a very embarrassing bug from the developers’ perspective. They should’ve had tested it more thoroughly. Other than that, as far as the stability of the OS was concerned, it was excellent. Performance-wise, compared to the other two, it was slow to boot and shutdown. But compared to its predecessor, things have been improved nonetheless. Ubuntu GNOME 16.04 LTS too had a issue. Although it’s wasn’t a major one compared to the Kubuntu installer issue, it delayed the boot-up process by around 15-17 seconds which was somewhat irritating as well. Luckily, it was fixed through a system update. Other than that, it too was very stable. So that’s it folks. I gave you the numbers concerning performance and shared my experience as far as the stability was concerned. The choice is yours to make. But again, please remember that my hardware is quite compatible with ‘Linux’ to begin with. So that whole ‘quite stable’ statement, well, take it with a grain of salt. However, that’s not to say that it’s completely useless. Because for instance, the fact that I didn’t see a single user application crash (except on Ubuntu GNOME) has nothing to do with my hardware (on some situations they’re responsible for crashes, though). Thus, to a certain degree, it’s still a useful observation. Before heading towards the download page also make sure to thoroughly read the release notes because they contain information about bugs and known issues that give you valuable insights of what to expect. *. If you’re interested in Ubuntu 16.04 LTS, get the release notes from here and download it from here. *. If you’re interested in Kubuntu 16.04 LTS, get the release notes from here and download it from here. *. If you’re interested in Ubuntu GNOME 16.04 LTS, get the release notes from here and download it from here. I found Ubuntu Gnome installer buggy on my system as it fails to load partition manager when I choose “something else”. Thank you for the feedback, especially concerning the installer Hosein. I’ve just received a new laptop (as a gift) which has some not so Linux friendly hardware. So in my future reviews, I’ll use both laptops to better evaluate the stability. Thanks again. The performance on my laptop improved from Ubuntu 14.04 to 16.04. The sistem feels more lighter and more responsive than 14.04, I didn’t used Gnome3 since it’s release when I tested it and vowed never to touch it again. Unity on the other hand improved in the performance department with every Ubuntu version. You may be able to get best performance and compatibility if you were to install the core of each popular GUI shell directly into Ubuntu. I’m not so sure about that. Installing each desktop shell into a single Ubuntu core would’ve increased the shared libraries and startup services etc and could’ve actually degraded the performance. Good observation. However, if you look at the error of the Netrunner 14, you’ll also see ‘ubiquity’ in its error as well. Now I’m not so sure, but since Calamares is an installer framework, maybe Kubuntu and Netrunner are just using Ubiquity as a GUI wrapper because it supports both GTK and Qt GUI frameworks. Or I could just be so wrong here 😛 . finally come up with best review.. but i expected more i.e. testing distro after installing all real life useful **ware viz. skype, steam, media codecs, etc..
Good point. I’ll try to keep those in mind in future reference. That said, Adobe Flash worked seamlessly on all three flavors (with Google Chrome installed manually) and VLC performance was also excellent. What about other ubuntu’s (like Lububtu for example) ? Time is what I don’t have these days 🙂 . I’ll try to come up with a comparison, can’t guarantee it it though. Take a look at Antergos OS, it offers Gnome as its default offering but has many other DE options such as KDE and more. Based entirely off Arch, rolling release, all updates are received as soon as they are received by Arch repos. In my opinion it is a fine distro, far far better than the *buntus. Hmm, interesting distribution. I’ll have a look, and than you for the suggestion. Unlock widgets -> click and hold left mouse button on the widget ->from the menu that appears after few seconds -> click and hold first icon and resize widget. Thank you Michal, it actually worked! I updated the post. I have no idea why your boot times are so rubbish. I perform a full reboot, desktop to fully loaded desktop in 18 seconds on Ubuntu 16.04 with a Sandisk SSD. Well there you have it Steve. You’re using a SSD and I’m on a HDD (7200 RPM). 3 completely different machines with 16.04, all work flawlessly, no tweaks needed at all. I’ve never encountered the issue you seem to with system usage while copying files before. 1 is an Acer Aspire E 11 notebook with a Intel GPU & N2840 cpu & 4GB DDR3 Sandisk SSD.. No slowdowns or issues using the machine while copying files. 2 is a Toshiba Satellite C850D with an AMD APU & 6GB DDR3, 1TB 5200rpm hard drive.. No issues using this very low powered laptop while copying files. 3 is a Quad core 3.9GHZ Phenom II X4 with 12GB 1866 DDR3, Sandisk Ultra SSD, Radeon 7790 HD GPU.. Obviously no problems using this system nomatter how many things you try to throw at it.. I even have over 100 tabs open and there isn’t even a hint of slowdown. 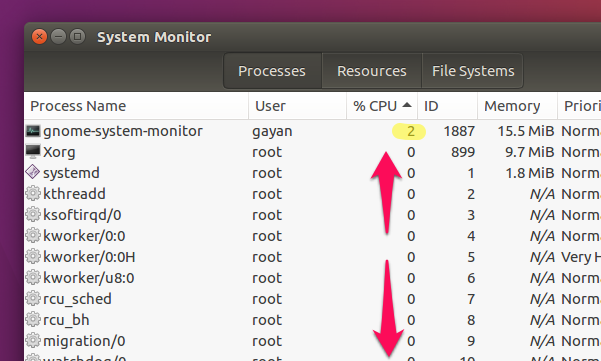 The only time I’ve seen issues while copying files is when the cpu is at 100% on lesser powered machines.. I am a little late to the article, but still, really good article. And a special double thumbs up for using a ‘real PC’, instead of a machine with i7 next-gen, 32 GB of RAM, & some hyper ultra extreme ssd which costs $2000+. I have had similar experiences with all of them as well except i haven’t encountered the calamares crash, yet. I normally like KDE as it is more tweakable and wastes way, way less screen space than gnome or unity. But, while kubuntu 16.04 is clearly faster than 14.04, KDE5 has ditched the global menubar applet (a must-have for me), graphics in general seem glitch-y and it has a broken custom shortcut system (e.g. Trying to reassign ‘backspace’ in dolphin for ‘folder up’ (parent folder) instead of ‘folder back’ (previous directory) just doesn’t work anymore). So at the moment I am running ubuntu 16.04 though i might go back to kubuntu 14.04.4. What is your daily driver now? First of all you’re welcome. I’m using Ubuntu 16.04 LTS (Unity) as the main operating system, although I’ve also quite consistently been using Linux Mint 18 Cinnamon edition for the past 8-9 days after reviewing it because it’s quite a pleasant desktop to use (I’ll be switching to Ubuntu shortly). You’re welcome. As for the request, I may not do that mate. I mean, it’s been a little while since Ubuntu 16.04 LTS released and it’s kind of old now 🙂 . That said, Ubuntu 16.04 LTS was updated few days ago, so I’ll give it a little thought, can’t promise you anything though 😉 . Thanks for this very helpful review – on many levels. (1) has the “Software Center” issue change appreciably? (2) are there alternatives to the ‘default’ Software Center? Thanks for the very useful comparing/review. I’m only missing a little Xubuntu in the review. Maybe next time? Further I miss the system requirements for the distributions. Based on this review I like to try Kubuntu. But I m doubting if my computer is not to old for it. (Intel(R) Core(TM)2 Quad CPU Q8200 @ 2.33GHz and 4Gb RAM. I think your computer would do just fine under Kubuntu (yes, I’ll include Xubuntu in the future reviews as well). I just installed Ubuntu 16.04 lts here in my laptop (a low end machine) and commonly it gets too laggy even more when i open genymotion with more than 15 tabs in the browser, the time of boot speed until it show up the desktop screen are horrible, worse than windows 10 here. also I’ll consider my pc settings (asus s400ca – core i3 2365 and 4gb ram) unfortunately I have no money for a ssd to improve my works, prices are a bit difficult here at the moment (as usual for real) I live in Brazil. Have you tried Linux Mint 18 Cinnamon? Not yet, is it good for low performance laptops? between kubuntu and the ubuntu with unity, the kubuntu would be better ? Thanks. Considering your Core i3 and some of the other hardware details, Linux Mint should run quite well in it. My old laptop (Dell Vostro V 131 – discontinued product) has similar hardware specifications and Linux Mint always have really quite well (I haven’t tried the latest version of Linux Mint on it though as I’ve switched to a new laptop). Just out of curiosity, do you have enabled a space for ‘swap’ (‘virtual memory’ as Windows calls it)? Because I’ve found that by enabling swap, it sometimes gives the OS some ‘relief’ thus helps to reduce some of the performance related issues. Thank you for this description. Since I’m using Kubuntu 16.04, fortunately I can notice to have not found any trouble that you describe. I can only confirm a delay for switching on and power off, a bit slow honestly but better than windows however! Thank you for the comparison gayan..